All the little things you'd need to know about renting a bike in this town. The best thing to bear in mind on the roads in Chiang Mai, is that the traffic flows like water – if you don’t fill a gap, someone else will fill it. You can stand on the side of the road and watch this, especially around busy intersections – cars will bunch together and scooters will flow through the gaps between them. Do you have big bikes? No. Our biggest scooters are 125CC models. There are other businesses in Chiang Mai for renting bigger bikes, which you can find online. Your deposit is either 2000 baht, or you can either leave your valid passport with your Thai entry stamp. Cash is king. However, we also accept Paypal or bank transfer – however, the customer has to pay any transfer fees with these methods of payment. Can you deliver the bike to my house or hotel? Yes. If you are renting for 2 weeks or more, delivery is free. Am I insured against theft and accidents? We have the Thai P.R.B. Insurance on each bike. We also offer an additional insurance plan. However, we recommend that you have appropriate Travel Insurance which covers theft and insurance. 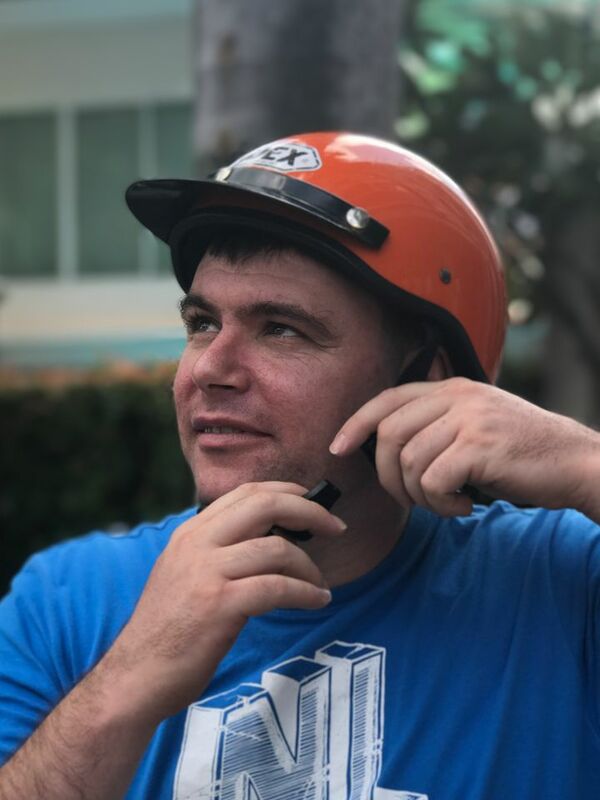 What documents do I need in order to rent a scooter? You need a valid passport with a valid visa/stamp for your stay in Thailand. We will not rent to you without it. You either need to leave the passport with us, or we can photocopy it and take a deposit, in order to rent the bike. Are there any other safety considerations I should be aware of? Please be careful at traffic lights. Often, drivers will drive through a red light if it has only just changed from yellow/amber. At most but not all intersections, you can turn left on a red light. Often the intersections where this is forbidden are only signposted in Thai, so watch what other drivers are doing. Please be careful of pot-holes – roads in Chiang Mai are quite good, but there are always areas in need of repair. Every time you put petrol (gasoline) in your bike, you should also pump the tyres. This makes it less likely that they will puncture, and makes the bike easier to control. There are machines at most Petrol (Gas) Stations, and you should pump the tyres to 32 PSI. What is the legal blood-alcohol limit in Thailand? In Thailand you must not drive with a blood-alcohol reading about 0.05%. At night, there are police breathalyser checkpoints around the city, and drunk driving carries a significant penalty, beyond just the threat to your safety and that of others. If you are American, please be aware that many parts of the USA allow 0.08% – and thus in Thailand, you will be unable to drink as much as you are accustomed before driving. Do I need a driver’s license to drive in Thailand? Yes. It’s up to you to have a valid driver’s license. If the police stop you and you are not carrying one, you will be fined. Alternatively, you can obtain an International Driving Permit before coming to Thailand. Either an International or a Thai license must be shown to police officers on demand. How do I drive around the moat? The Chiang Mai old city is surrounded by a moat. If you’re outside the old city, the road around the moat is one way: clockwise. If you’re inside the old city, the road around the moat is one way: anticlockwise. There are frequent intersections around the moat where you can cross over from one side to another, if you need to change direction. Where do I park my scooter? You can park on most side-streets. Shopping malls, hotels, and the busier parts of town have car/bike parking. If you see red and white stripes painted on the curb, this means NO PARKING. If you see yellow and white stripes painted on the curb, this means STANDING ZONE – you can only stop there a short time. People at the side of the road blowing whistles indicate usually that a car is reversing, or that this is a no standing zone and you should move along. There are also streets with NO PARKING during rush hour, and even streets (like the alleyways off Nimmanhaeminda Rd) where you park on one side on odd days and the opposite side on even days of the week. In these cases, the best thing to do if you are unsure is to follow where other scooters park. Absolutely. There are police checkpoints in the city, and if you do not have a helmet, you will get a fine. And more importantly, a helmet will keep your precious brain safe in the event of a collision. 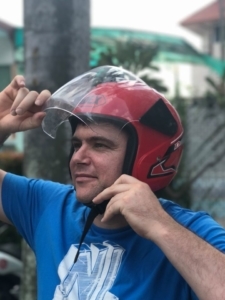 We can provide you with either a lid or half face helmet, based on your preference. In Thailand, we drive on the left side of the road. What if I need to change the outer tyre of my bike? Please contact us if there’s a flaw in your outer tyre, and we’ll change it ourselves – we’ll do whatever we can to minimise any inconvenience to you . But we don’t want you to get ripped off – sadly, some unscrupulous mechanics in town will overcharge tourists for tyres. What do I say at the petrol/gas station? Many petrol/gas stations in Thailand have attendants who will fill your bike. What do I do if I have a flat tyre? Tyres need to be inflated once a week. When you add petrol (gasoline) to the bike, you should inflate the tyres to 32PSI as well. However, if you have punctured the inner tube of the tyre, it’s usually because you have inadvertently ridden over something sharp, or possibly hit a pothole. In this case, you should contact a local tyre repairer. There are tyre repair/changing shops throughout the city. You can ask around, especially at Petrol (Gasoline) Stations or 7/11s. Also, there are mobile tyre repair businesses which you can contact (or ask someone to contact). 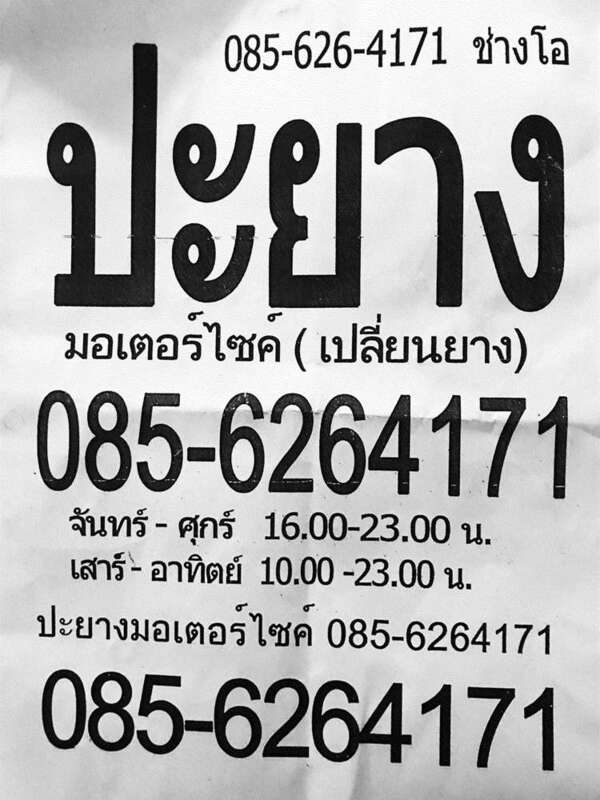 Outside businesses like 7/11s on power poles you will often find notices like this – you can either call/LINE the number yourself, or ask a Thai person to do it. If you can’t find anyone to call a tyre repairer, you can contact this number on LINE – send a photo of your bike, and then a pin with your current location. If you’re honest with us, we’re honest with you. Please contact us in the event of an accident. We base our business upon honesty and good reviews, so just let us know, and we’ll get it sorted – we’re never out to profit off a bad experience. While we always hope that all our customers will have a trouble-free experience, incidents do happen. Please ensure that you and anyone else involved are safe. And then please contact us – we can come and offer assistance anywhere in the city limits. If the accident requires police intervention, we would respectfully recommend that you do not sign anything that you cannot read yourself. Please contact us.